By the grace of God and the consumption of lots of coffee, we did it. We survived two weeks of swim camp. I have already talked about how hard the first day was. This next picture pretty much summarizes my feelings throughout the entire 2-week period. You know. 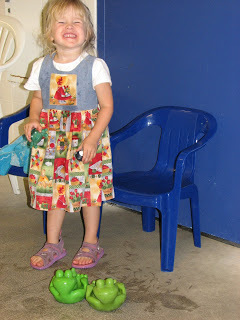 Wanting to be in on the action and to be able to just sit and observe your little learners, but instead someone is always running running running–in front of you and away from you but never ever toward you–and distracting you from your primary objective. When you have a fully clothed two-year-old and a swimming pool, though, she is your primary objective. And so it goes and so here we are then. A photo journal for the scrapbook, and a visual record of the summer my youngest drove me bonkers. 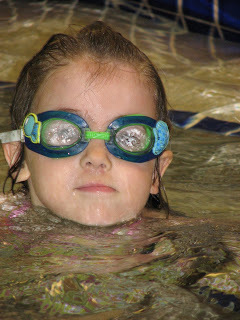 In addition to all the basic skills that we want our 4-year-olds to gain in the water, I think that the real reason we enroll them in swimming lessons is that they’re just so darn cute in a swimsuit. Cate’s teacher was a surfer-dude type guy. He was extremely animated and punctuated every second remark with a thumbs-up (or two). He was a big sweetie, really, and perfect for my little extrovert. 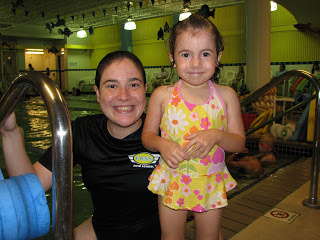 In the end and despite all my outward kvetching, I was very happy with the swim camp because, as pricey as a swim camp can be compared to the Y or something, (see footnote below), my kids came away really knowing something. The very cool Teacher Kyle and me boys. 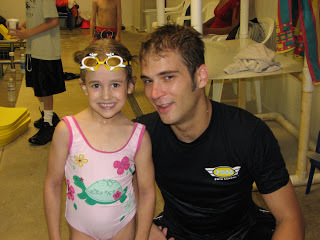 Footnote: Swim camp was an either/or proposition for my family: either we do swim camp and cancel our Y membership or we hang onto our Y membership and just do lessons there. There are pros and cons of both decisions, as I’m sure you know. The cancelled Y membership saved us some money in the end, yet not going to the gym hasn’t helped my end (or my middle, or my arms), which are getting a wee bit squishy. 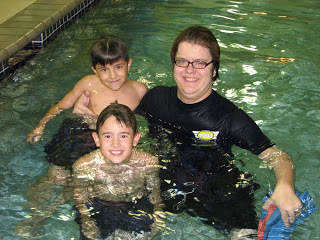 Proficient swimmers for a squishy mom. Such was the trade-off this summer. How fun (at least for them)! What great memories you’re making this summer! Congratulations on making it through. This was a very funny post. I’ve been through the wanting to watch my dc, but always chasing another one. Last year was my easiest. I sat out with a calm 4 yr old and a baby. 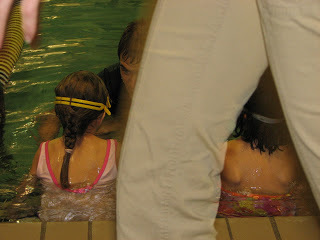 And this year at the Y, I’ll have 3 little swimmers, and one little 18 monther to chase. Aaaahh… squishy moms are good for squishing!